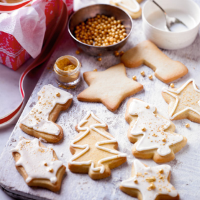 Children and grown up's will both love making these delicious, iced Christmas biscuits. 1. Put the flour in a food processor and add the butter, cut into small pieces. Blend until the mixture resembles breadcrumbs. Add the icing sugar and blend briefly to mix. Add the egg yolks and vanilla and blend again to make a smooth dough. Wrap in clingfilm and chill for at least 1 hour. 2. Preheat the oven to 190ºC, gas mark 5. Grease 2 baking sheets. Roll out the dough to 5mm thickness on a lightly floured surface. Cut out shapes using Christmas cookie cutters and space slightly apart on the baking sheets. Re-roll the trimmings and cut out more shapes. Bake for about 10-12 minutes until pale golden around the edges. Leave for 2 minutes then transfer to a wire rack to cool. 3. Decorate how you wish. Pipe outlines around the edges of some of the biscuits using the tube of designer icing, fitted with the fine nozzle. Put the icing sugar in a bowl with the lemon juice. Gradually work in 2-3 tbsp cold water until the icing is smooth and has a consistency that’s thick but becomes level when left to stand. Spoon a little icing onto half of the outlined biscuits, spreading it into the corners with the tip of a cocktail stick or skewer. Leave the remaining outlined biscuits unfilled. 4. Dip a pastry brush in the rainbow dust and gently flick a little over the icing. Scatter with gold pearls. These biscuits will keep in an airtight container for 3-5 days.